Well, if you haven't heard, it is official. The Dental Board of California (DBC) passed the language of Assembly Bill 1277 back in May 2018 and it is calling all dental professionals to higher standards in dental unit waterline maintenance. 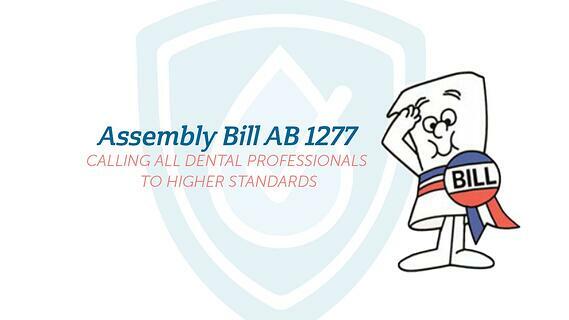 Assembly Bill 1277 calls on the Dental Board of California to amend the minimum standards for safety of dental water used in procedures that expose dental pulp. Spurred in large part due to the Anaheim outbreak of mycobacterial infection that hospitalized 72 children - many with severe complications - and was traced back to a children's dental clinic with un-tested dental unit waterlines. With the acceptance of the proposed bill language, the Dental Board of California will move forward in the finalization of legislative and regulatory processes. The board is in the midst of a 45 day listening period to gather feedback on the bill - we expect to hear final language and next steps in late August [As of August 15th, it appears the DBC will not address this at their meeting at the end of August - stay tuned for updates here at ProEdgeDental.com]. Per the mandate of the bill, the new standards could be introduced anytime within the next year. If you are a California dental professional, you’ll want to be ready to ensure your practice is in compliance and your patients are getting the best care. Below you’ll find the most up-to-date information about the new dental waterline standards. Each of the highlights below contains the exact language of the proposed bill so that you can understand exactly what will be expected of your dental practice. We can make this really easy for you. Our BluTab Waterline Maintenance Tablets are an EPA approved and award-winning disinfecting/antibacterial solution for these procedures. It is one of the most effective and economical methods on the market. Click Here to Learn More, or Order a Free Sample. Rids potentially contaminated air and water from your dental waterlines. In addition to purging and flushing, we must stress that regularly shocking of your waterlines is a vitally important component of quality dental waterline maintenance, regardless of the product you use. We've tested well over 100,000 waterlines and this continues to be true. Click here to learn how to shock your dental waterlines using bleach. Dental waterline monitoring is the same thing as dental waterline testing. And testing is the only way to effectively monitor your dental unit waterline quality. Check with your treatment manufacturer for instructions on how often you should test, although, ProEdge recommends a minimum of quarterly testing. Even treated dental unit waterlines fail 30% of the time and 61% of practices have at least one failed line when they test. So, it's not a luxury; it's an important part of every waterline maintenance protocol. To learn more about waterline testing, check out the ProEdge Dental Waterline Testing Comprehensive Guide. Keep bacteria at bay to maintain clean lines. Utilize a safe chemical at a safe level to go into the patients mouth. Because of this, waterline treatment products are much better at maintaining already clean lines rather than disinfecting (or reducing the bacteria counts) them. Add in the sometimes confusing directions, poor labeling, improper use, or a lack of shocking beforehand, and treatment products are definitely capable of failing. Our lab compiled data from over 20,000 consecutive dental waterline tests and discovered the average pass/fail of different types of products - you can view that information here. With any product, make sure you carefully review and follow all of your treatment product's instructions. ProEdge is the most experienced dental water lab in the world. We use a proven testing method that neutralizes your sample to accurately determine the safety of your water compared to the CDC’s less than 500 CFU/mL guideline. And our team is always available to help you achieve safe water - no matter what protocol or service you use. If you have any troubles or want to learn more about our testing methods, you can contact our team and we'll be happy to help. Learn more about why shocking is important no matter what protocol you’re implementing and how you can get started today. Learn more about the importance of dental waterline testing in offering the highest quality of patient care and protection. See the full research results from over 22,000 dental waterline tests on the effectiveness of the treatment products on the market. Get a free month's supply of the most effective and economical dental waterline treatment available.